The day a U S couple got arrested for Kissing! Few Americans know that there still is a Connecticut law in force in Hartford, which states It is illegal for a man to kiss his wife on Sunday. At least one American couple couldn't believe itself when the pair were hurled in to a police vehicle for kissing in public on a Sunday! This bewildered couple was not in Hartford but was visiting Kerala, an Indian State which takes great pride in calling itself God’s Own Country, where laws written by Gods are still Gospel truth. In fact the local police chief, who happened to be a lady, was simply enforcing an Indian law which makes it illegal for anyone to kiss in public on any day, when the couple, unaware of the local law, kissed before a camera at the request of a journalist who was covering an unusual event. Anti Kiss of Life protesters being chased by police. 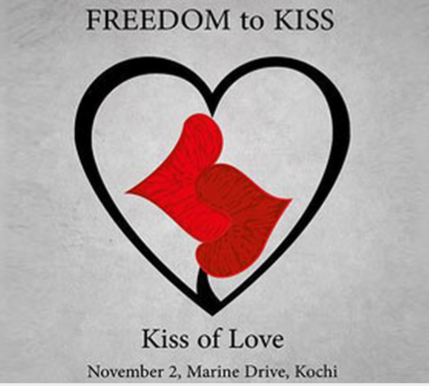 The event which was christened as Protest By Kissing was organised by a Facebook group called Kiss of Love, exemplifies the Indian struggle to catch up with modernity. This unusual protest by breaking an age old law was a public reaction to the high handed puritanical moral policing of the BJP of Prime Minister Modi, whose members had ransacked a local hotel for allowing its customers to kiss and romance. The unusual media coverage the event received in India and the way the whole episode sort of fissile out show the double standard on morality most Indians can’t shed despite the progress the country has achieved. Though initiated by a group of people with progressive views on liberty and freedom of speech and expression active on social media, the movement soon gained political overtones inevitable in one of the politically conscious states of India. The puritanical moral policing was an act of the BJP, backed by India’s Hindu religious fundamentalists, who aim to grab the power from the Congress party who currently govern Kerala. On the other hand, Kerala’s communists who are constantly fighting off the BJP has seen a political opportunity. 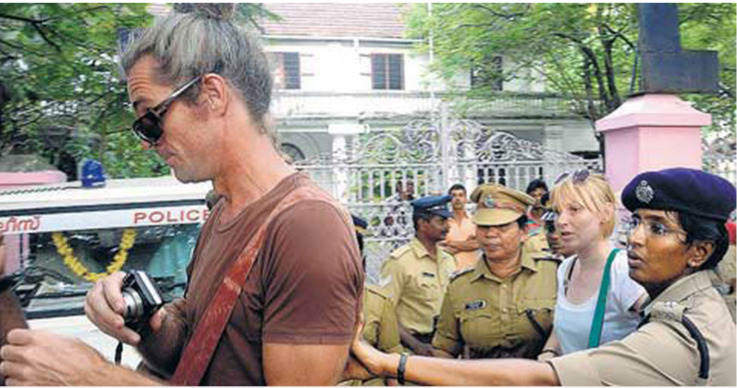 The result was that the Kiss of love event which was organised to be held peacefully was opposed and disturbed by various organisations under all of these political set ups, forcing the police to remove the handful of the participants even though the government did not intent to enforce the law. The disruption by the political parties were organised with an eye on the coming election so as to position themselves on the right side of the kissing divide. But it clearly demonstrates the hypocrisy of a society which wants to align itself with the free and liberal outside world. 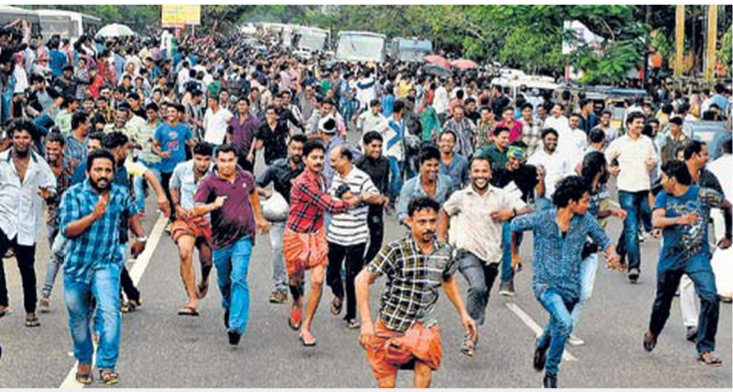 Though this was an isolated incident which occurred in Kerala, a state politically and socially ahead of rest of the country, the approach of the BJP which has succeeded in grabbing power at the national level by unifying and concentrating the votes of the Hindus who form the majority, in holding on to the archaic social set up of India is what worries the progressive minded in India. 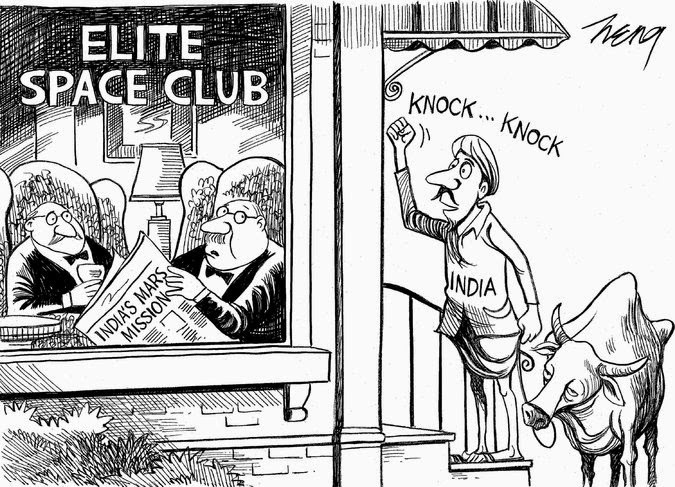 New York Times cartoon on the success of Indian Mars Mission. Incidentally this was reflected in a cartoon by the New York times on the occasion of the success of India’s Mars mission, which lead to widespread protests and eventual apology from the paper. Kiss of Love Facebook Group. Meanwhile, the Kiss of Love brigade of Kerala has actually claimed success of their movement and promised to regroup and continue their efforts to change the social attitude of their countrymen regarding freedom to love and expression of love. No summer's high, no warm July, no harvest moon to light one tender August night. No autumn breeze, no falling leaves, not even time for birds to fly to southern skies. So wrote Stevie Wonder about an ordinary day he sang three ordinary words which meant almost everything to a generation. It was on such an ordinary autumn day that a woman who touched the hearts of a whole generation for her courage was felled by assassins. It is exactly thirty years since that day dawned in the life of many people as an ordinary day and set like an extra ordinary day they could never forget. For me, it was a train journey which started as boring as any in an Indian train but grew very frightening towards the end and ended with a very unusual and uncomfortable experience of having to be pulled home by another human being. That is what stand out as the background of the events of that tragic day for me. It was because, the train which departed early morning on that day had all but one stop and there was nothing called a mobile phone. The news of an assassination at last trickled down towards the afternoon when the train pulled up at an unusual stop, waiting for clearance to proceed to the destination as massive disturbances started to occur all over India. Not knowing what happened or if it was only a rumour, the immediate concern was getting home safe and the shock and the sinking feeling had to wait till watching the news being flashed on the TV screen of a neighbour. Events that caused immense shock to the whole world has occurred before and after like the assassination of President Kennedy and the 9/11. Days everyone remembers what they were up to when they heard the news. 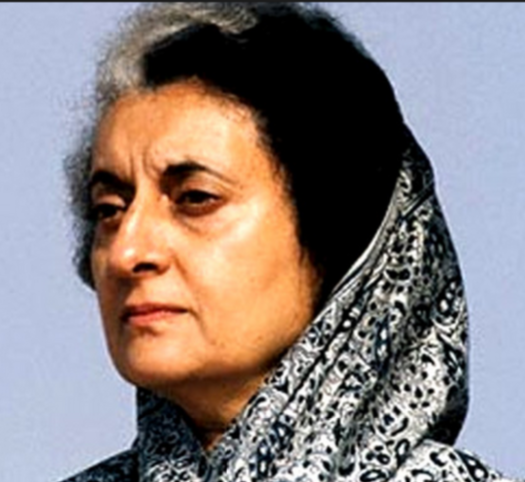 The cold blooded murder of Indian Prime Minister Indira Gandhi however was unique and different. Though President Kennedy was assassinated at the height of his popularity as bold leader of the cold war era, the world was only on the verge of media revolution and less connected for the news to dissipate. Time lapse perhaps diffused the shock though the angst and agony of the aftershock of an entirely unexpected and bold assassination and the immediate events which followed undoubtedly shook the conscience of the free world. No doubt the assassination of the young president Kennedy has left a indelible mark on everyone’s memory. In contrast, Mrs Gandhi’s murder did not come as a surprise, at least to those who were aware of the Indian politics. But when it came, it came down like a ton of hot metal on India’s conscience and a world at large which couldn’t believe such a tragedy could strike India and the Gandhi name twice. It didn’t go down to the bottom of every heart with the force of the bullets which ripped her body but as a deep strike of knife which pierced the deepest affection and admiration for a leader who willingly sacrificed herself for what was right for the integrity and unity of the nation. Unlike President Kennedy Indira Gandhi was not at the height of her political career. Mrs Gandhi could have run away from it all. She was warned. She knew it was coming. She could have the protection she wanted to avoid it. Yet she was a leader who somehow knew that it will not be her political legacy and achievement but her courage and valour as a woman which will be the most precious gift she could leave for the nation and the world, which will make them to hold her close to their heart. The nation heard with apprehension and discomfort when she spoke on the eve of her death about her premonition but couldn’t fathom her courage of conviction about what she will be dying for till that actually happened. Nobody knows how many attempts have been made to shoot me; lathis have been used to beat me. They have attacked me in every possible manner. I do not care whether I live or die. I have lived a long life and I am proud that I spent the whole of my life in the service of my people. I am only proud of this and nothing else. I shall continue to serve until my last breath and when I die, I can say, that every drop of my blood will invigorate India and strengthen it. Indira Gandhi will be remembered not as woman who wanted to build a dynasty and leave it behind but as someone who spoke out those words loud and clear for the world to hear, fully aware of the approaching death before her. Naturally, you need to have a feel of what women are made of to appreciate the greatness of Indira Gandhi. It is almost a year since Chennai Express, a record breaking Indian blockbuster of the king of Bollywood, Sha Rukh Khan, was released. This Indian flick may have a few surprise lessons for students of the movie craft. It is one of those rare events on the silver screen, which provides a lot of insight to anyone seriously considering to master the craft of cinema and how to press the right buttons to enter the hearts of millions. Bollywood films routinely become blockbusters with record collections at the box office, thanks to a captive audience looking out for a pass-time and burdened with a deficit of IQ and excess of money in their pockets both in India and abroad. Chennai Express which got only sub zero marks from film critics, but managed to add a record number of zeros to its box office collection, however, is different and something of a a mystery of the Indian silver screen. No one really knows how and when the ‘rail cars’ of Chennai Express, with such complexity that they could all have hardly come alive in a single brain, came together. If Chennai Express was a typical director’s film it might have been a Rohit Shetty film. It is actually a unique flick, with a lot more deeper and serious facets to it than a film director’s work of entertainment. Many of those can be attributed to its hero, the Indian movie star and entrepreneur, Sha Rukh Khan. A rail car named desire. It is clearly the enormous desire of Sha Rukh Khan to make more money by investing wisely in a sure-fire formula which compelled him to venture out to make a film with Rohit Shetty, who is a young Indian director with a string of blockbusters under his belt. Rohit had cracked what the modern Indian audience wanted and was ready to to pour oil on any desire which made good commercial sense. The result could hardly be anything but explosive. Chennai Express, a deceptively dangerous theme, was the product of bold commercial vision of Khan, as suicidal as it is genius. With the fire of desire in its gut, the express train of Sha Rukh and Rohit Shetty could have gone in any direction, but it took a southern turn with its script writer Subhash, son of a veteran southern film director, connected with the leaders of linguistic strife in India before independence. It was no surprise that his script came with a genesis of an impossible dream of unity and harmony between southern and northern India, which broke down with the departure of the British and was aggravated by the linguistic division of India after independence. From Helen of Troy to Gone with the wind, regional human conflict had been the backdrop of great classics, depicted truthfully and presented to audiences who can discern life from entertainment. However, it would be utterly irresponsible to ignore consequences of chauvinism, even if it is in mere movie entertainment, in the 21st century India more divided and ignitable than ever. The script of Chennai express, dealing with the love of a northern man to a southern belle was explosive any day, novel yet fraught with danger of massive protests and national grief if not a civil war, with the risk of negative stereotyping of south Indians. Though the script has a strong message of the power of love to unite everyone, almost impossible to deliver today as it was nearly a century back, the great Khan was audacious enough to grab it because he saw a divine touch of great commercial success. What actually created the spark of creation of Chennai Express was a touch almost divine as the one in the Creation of Adam of Michel Angelo. It was the final touch of Khan’s own blockbuster Dilwale Dulhaniya Le Jayenge, still running in Mumbai after two decades, as the longest running flick. Khan has instantly recognised that the feel of goodness where he left off in DDLJ is his ticket for Chennai Express which had the pulling power to drag millions of Indian hearts along with him in to it. It not only sealed the script of the movie but also the soft corner he has managed to sneak in to in millions of hearts worldwide. As the story goes, Draupathi, wife of the Pandavas in the Indian epic of Mahabharata, asked a poignant question to Lord Krishna, who was about to embark on a peace mission to appease the Kauravas, the arch enemies of the Pandavas. The latest controversy in the life of Sasi Tharoor, once a candidate for the post of the U N Secretary General, reminds of this episode and beacons the question what his deceased wife Sunanda Pushkar would be asking him if she was still alive. Sasi Tharoor and Sunanda Pushkar had a brief life together reminiscent of "The fault In Our Stars", the latest romantic flick enthralling film lovers of the world. The Fault In Our Stars may not replace "Love Story" at least in the hearts of the baby boom generation, but will resonate with the story of romance, jealousy, sacrifice, union and tragedy the amazing short life of Sasi Tharoor with the beautiful Sunanda Pushkar in the hearts of a lot of younger Indians. Draupathi, who was disrobed and humiliated in public by the Kauravas in front of her five powerful husbands, asked the lord if he forgot why her hair, which she had wowed to leave loose till the Kauravas were annihilated, was not plaited. It is only natural that Sunanda, who was once called Rs 50 Crores girl friend of Tharoor by his political foe Narendra Modi, would have questioned Sasi Tharoor with no less vehemence and rage at the overture of her husband to the same man. There are none so blind as those who won’t see. How can a person with the highest of education and international exposure miss the danger posed by the blind ambition of a person like Narendra Modi? Narendra Modi has not apologised to Sunanda Pushkar before or after death which beacons the question what has made Sasi Tharoor to warm up to someone who has not only insulted him and his wife but even his government headed by Dr Man Mohan Singh by his snide and thoughtless remarks, especially when the ex Prime Minister had promptly asked for his resignation instead of defending a brilliant minister of his team.